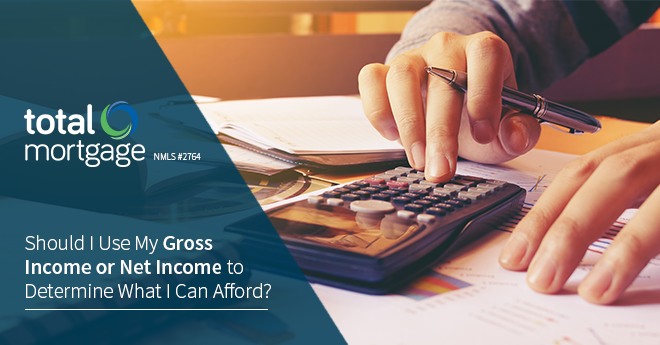 When buying a house, should I use my gross income or net income to determine what I can afford? There’s a big difference between your gross income and your net income. Your gross income is the money you earn each month before taxes are removed. Your net income is that same income after taxes are removed. No surprise, your net monthly income is usually much lower than your gross monthly income. When it’s time to buy a house, though, which figure should you use when deciding how much home you can afford? This is an interesting question. When you apply for a mortgage loan, your lender will rely on your gross monthly income to determine how many mortgage dollars to lend to you. This doesn’t mean, though, that you should rely on gross income to determine how much of a house payment you can comfortably afford each month. Look at it this way: Your net monthly income is your realistic income. This is how much money you are bringing into your house each month. If you want to make sure that you can afford a monthly mortgage payment of $1,500, $2,000 or $3,000, it’s more realistic to consider how much of your actual take-home pay your mortgage payment will consume each month. Here’s another tricky matter: Most mortgage lenders today say that your total monthly debt – including your mortgage payment – should total no more than 43 percent of your gross monthly income. Again, that’s your income before taxes are removed. Are you comfortable with monthly debts that consume that much of your gross monthly income? Maybe. But if you don’t want to struggle each month to pay your mortgage payment – not to mention all your other monthly bills – it makes more sense to look at your net monthly income when determining how much home you can afford. If I want to refinance my house, when they ask income is that gross income? And how much is the closing cost? Hi Annie, yes, income in this case would mean gross monthly income. Closing costs can vary depending on your situation. Would you like me to have a mortgage expert shoot you over some more details to the email you provided?